It has been “one of those days.” I think everybody knows that being a parent is not all sunshine and roses. We all have difficult days when it seems that our best efforts to discipline in love, to stay calm when our kids are tantruming on the floor, simply are not enough. We snap back and punish harshly. We throw a big fat tantrum ourselves. Our children fail on a daily basis, and so do we. And often we get to the end of the day and wonder, does that mean that we are failures, too? Maybe I am the only one who feels this way, but I doubt it. Because I am responsible for setting the tone in my home, I blame myself for a lot of the kids’ mistakes. After all, they do learn from what they see me doing. If I don’t always respond to them in love, I cannot really expect them to do so very much of the time, can I? Yet, I also know that Satan loves to heap guilt and shame on my hurting mama heart, causing me to feel defeated and discouraged. 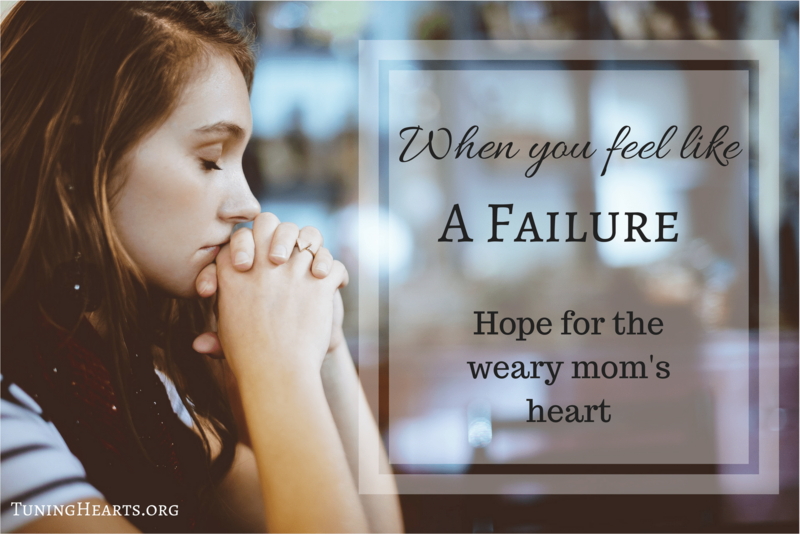 His accusing words that I am a failure, that I will never change, that I am ruining my kids, all pile up with so much weight that I can easily feel as if I might as well throw in the towel and give up before I’ve even begun. My tendency to perfectionism does not help. If I cannot do something without messing up, I am prone not to even attempt it at all. What is the point if I know I am just going to fail? But in motherhood there is no giving up, no choice but to attempt to do better tomorrow than I did today. So what is a beat-down and discouraged mom to do? That is the question I am asking myself tonight. And here are some of the answers that the Holy Spirit is bringing to my weary heart and mind. Seems obvious enough, at least if you are a person of faith, right? But other than a quick, “God, help!” right before freaking out over a child disobeying for the 500th time that day, do we really take the time to stop and pray over the matter? I, for one, know that I have not spent enough time truly praying for wisdom and discernment as to how to deal with specific behaviors; nor have I prayed enough over my children, that they would have tender hearts open to my guidance and teaching and to the Holy Spirit’s own work in their lives. Busted! Yeah, I definitely need to pray more. 2. Find my identity in Christ. Satan’s lies are just that: LIES! In order to combat the negative, defeating thoughts he has planted in my mind and heart, I must fill myself up with TRUTH from Scripture about who I am in Christ. Jesus says I am victorious. He says I am an overcomer. He says I am more than a conqueror. He tells me I am His. He will be faithful to complete the good work He has started in me. When I was in counselling for post-partum depression after my firstborn, my counsellor gave me a list of Scripture references for just this purpose. It had all the statements made in the Bible about the believer’s identity in Christ. I guess it is time for me to dig that out and start doing some intentional Bible memory in this area. I have a stack of parenting books on the end table beside me. They all deal with topics related to grace-filled discipline and reaching the heart of my children instead of just correcting the outer behavior. I need these words of wisdom from parents who have walked this road before me. I only wish I would have started reading them long ago before some very bad habits got so ingrained in my parenting. But it is not too late to start the change. I also am thinking about asking some older homeschooling moms for resources and book ideas for some specific attitude and behavior problems we have been having with my oldest. I think we need to really focus in on some character traits that are weak (in both me and him! ), even if that means taking a break from our regularly scheduled school books to do so. And since many moms have been through these stages before me, there is no need to reinvent the wheel. I just need to seek out that good advice and take it! 4. Breathe. Relax. Slow down. The good news is that my children are young yet. They are still moldable and not set in their ways. A lot of the problems we are having are just ages and stages issues. We will get through this. And tomorrow is a clean slate. Sure, we have been through some rough patches lately, but that does not mean we have to let that define our family culture. We are in the midst of a move, a financially tight period, and a lot of change and upheaval is yet to come. It is ok if some things slide for a little while, if the school work gets a little behind or if we eat a little less healthy for a short time or if the kids have a bit more screen time than normal because I need to pack and clean. We can relax and breathe and have a little fun instead of always trying to push through and be perfect in the midst of the stressful time. Just take it one day at a time, I tell myself. Breathe. Smile. Look around and count your blessings. Tomorrow is a new day.